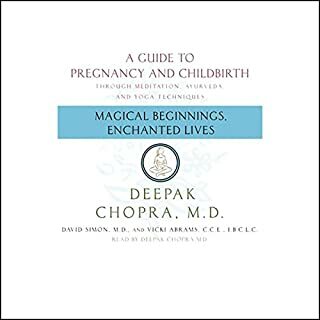 A much-needed antidote to our modern, assembly-line approach to childbirth, this new book is designed as a guide for all who wish to participate in the wondrous process of bringing new life into the world. Its ideas derive from two sources: the ancient wisdom of Ayurveda, with its emphasis on body, mind, and spirit; and the latest Western scientific prenatal research. First, I loved the narrator's voice for this book. It was soothing and melodic without making me feel sleepy, as if I could slip into a meditative state just by listening. I found the information to be very actionable, with lots of step-by-step instructions for using herbs, making compresses, and dealing with emotional highs and lows. In terms of content, I did not feel that it was too "out there" or "new age-y." As a thinking woman, I appreciated the concepts associated with Ayurveda, and that they didn't go so far as to rule out or chastise modern/Western medicine. The chapter on diet is especially helpful. I also liked that they did not make C-sections or drugs during birth a crime, like some other natural birthing books do. I found the constant nods to self-care, relaxation, and bonding to be the highlight of this book. I will probably pick up a print version of this book, as there are lists and break-out boxes in the book that I'll want to refer back to throughout my pregnancy. I think the audio version is best for some of the guided visualization and meditation portions of the book though. I'm not giving it the full 5 because at the end of every chapter they rattle through a list that is built on throughout the book from beginning to end, and it kind of irritated me after a while. I am the owner of an interactive agency, so I get that social media is a fundamental shift taking place in our society, and I'm really tired of reading about books that try to get other businesses to "get it." 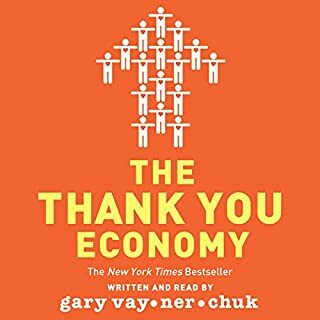 That's not what Thank You Economy is about. This book is about the underlying change in consumer behavior that makes social media critical for a business, which is people are doing business with companies that they like and love. Gary Vee does an outstanding job of explaining how and why this shift is occurring, and gives a whole slew of examples of exactly what to do with the section on case studies. I give every new client we land at my agency this book when they come on board. I think Gary Vaynerchuk hit the nail on the head with this one.